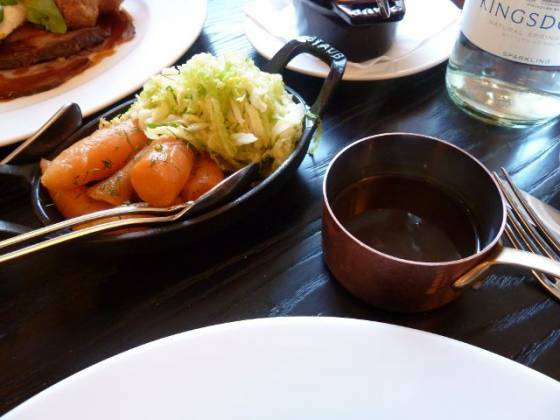 We were looking for another Best Sunday Roast in London review… With anticipation, I booked The Jugged Hare in Islington for this week’s Sunday lunch, my birthday meal with Claire. We attended the launch party a couple of weeks ago, so we knew the decor and the venue. 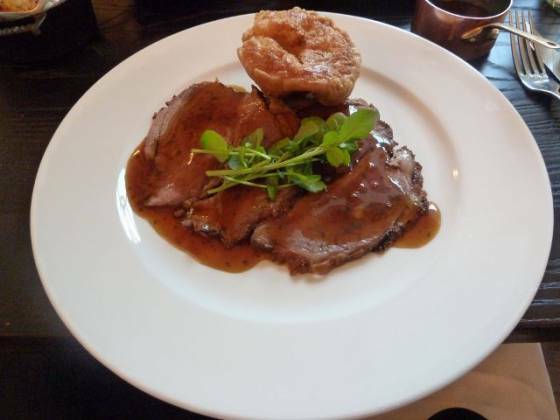 It is actually almost right next door and on the same street as their other venue, Chiswell Street Dining Rooms (review available here – it was top rated). As The Jugged Hare was fresh in my mind, we just had to give it a go. Booking was simple – merely a quick phone call a week or so beforehand. The website hasn’t fully been uploaded yet – there is a holding page explaining who they are and how to get in touch (we visited only a couple of weeks after the pub launched) . In researching for this post, I have just checked their site and it appears to have been sorted out. We received a call the morning of the booking just to make sure we are attending. Some people may get annoyed with the “checking up”, personally I think it shows great management of their bookings – if someone is unable to make it, then another person may miss out on eating their because of the missed reservation. We arrived pretty much dead-on our booking time of 1pm. I decided to drive up (as it’s a bit awkward by train from Bickley). Single yellow lines across the road denoted free parking on Sunday’s (not quite so lucky during the rest of the week). 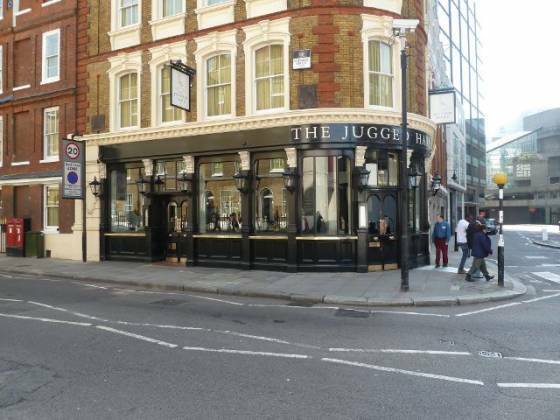 Walking through the doors of The Jugged Hare, the bar area is on the left hand side and straight in front was the front desk of the restaurant. I was keen to get stuck in, so we went straight through. We were shown to our table, and presented menus for the wine and also food. We were sitting in the restaurant area, opposite the very large rotisserie (I was informed that it was the second largest in the country!). 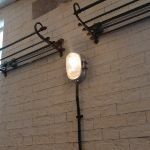 The decor seemed a halfway house between industrial and plush, with interesting lights on the wall and “wipe-clean” white tiles on the wall and ceiling. 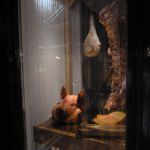 With a display case / window into the cold cellar in the stairwell holding meat hanging from a hook and a pig’s head in a pool of blood, perhaps “butchery” is a better fit? Don’t get me wrong, it works – and very much a talking point. The waiter was helpful and provided walked us through the various choices on the menu. Looking over the drinks menu, they have a plethora of wines (something they, quite rightly, are proud of). Unusually, they actually offer a very nice English sparkling wine, called Chapel Down, by the glass (normally this is “by the bottle” only). Claire went for one of these, I went for a diet coke. On the note of drinks – they also have their own bottled beer, The Jugged Hare Ale, pale beer. The food menu had some interesting surprises. If we went for one of the “grills”, we would have had to have chosen side dishes (much like how Gaucho Grill or Hawksmoor work). Some of the sides sounded quite interesting, such as cabbage and bacon, parsnip and garlic gratin, or even cauliflower macaroni cheese! On the roast dinner decision, I decided on the roast lamb, Claire went for the roast beef. Claire also fancied the parsnip and garlic gratin, so this was added to the order. 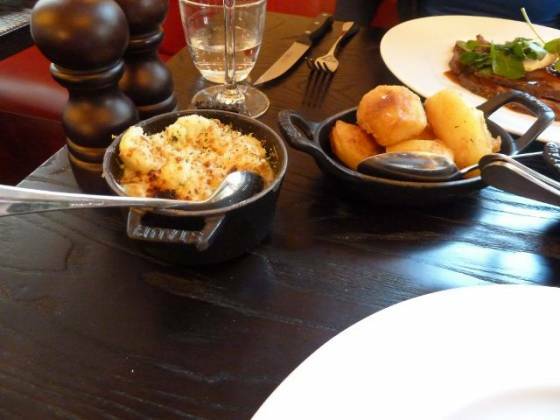 We were served some bread for the table, and once again (as in, Chiswell Street Dining Rooms) “proper” butter too, on a slate! The bread was warm, crispy and delicious. Our food came out shortly afterwards. We both had a plate each with our chosen meat, as well as potatoes and a small amount of jus. Next, 3 cast-iron dishes were brought out with vegetables, cauliflower macaroni cheese and lastly the parsnip and garlic gratin. I asked for more gravy – was told it was already coming. Someone appeared by my side with a mini saucepan (about 2″ diametre) with more jus. There was a lot of food on the table, and very well presented too. So, tucking in – the lamb was perfectly cooked, very tender and a lot of it. The fennel crust seasoning tasted very nice, and the delicate mint sauce gravy nicely complimented it. I tried Claire’s roast beef, exactly to my liking (I almost wished I ordered that, or even better – having both meats on my plate!) Claire normally has her beef cooked medium-well, this one had some pinkness, but it actually converted her over to the appreciation of medium-ness -I count this as a success all on its own :-) She also really enjoyed the horseradish cream. The roast potatoes were pleasant, (I’m nit-picking here…) just needed a slight more crunchiness to be perfect. On to the vegetable selection – shredded green cabbage and chanetly carrots (I believe) were in one dish, and tasted nice and fresh without being overcooked. Claire found the parsnip and garlic gratin to be out of this world, and whilst she loved the whole meal, this was to be the highlight for her. The cauliflower maccaroni cheese was surprising. Not a combination I would have chosen, but it actually worked very well. One slight criticism is that I prefer mature cheddar cheese with my cauliflower, something with a bit of bite and unfortunately this seemed either medium or even mild (mind you, they have to cater for everyone). Top marks for inventiveness though. 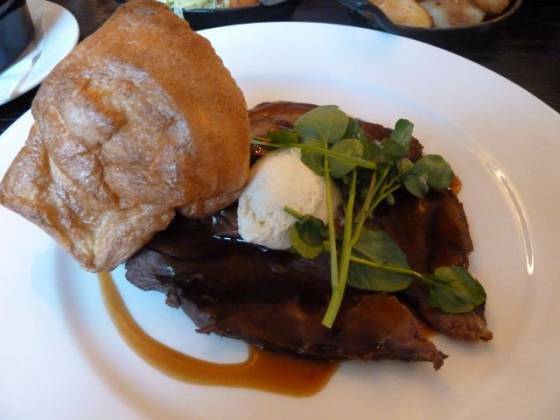 The yorkshire pudding and jus gravy were both excellent. The yorkshire was tasty, with a light and cruncy consistency. The jus was powerful and flavoursome without being overwellming. On to the desserts (it was my birthday, after all). I have to say, the pricing seemed very reasonable (considering we were in Central London), around £6.00 for a pudding. 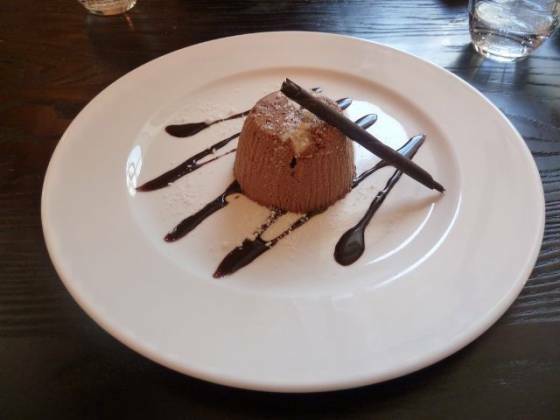 With options just as Kendal mintcake chocolate mousse, lemon junket with blood orange jelly and black treacle tart I was very much split between choices… in the end, I decided to go for the Kenal mintcake chocolate mouse parfait. The pudding was brought out. A circular dessert in the centre of the plate, with a spiral chocolate spear, drizzle of chocolate sauce and raspberries. Cutting into the pudding, I noticed chunks of Kendal mintcake. Taking a mouthful, it was heavenly… the mintcake and chocolate were a delectable match. The mousse texture was a great choice, and it being semi-frozen meant I had to take my time to eat it (instead of the usual shovelling down my gullet). I have to say, this was my highlight of the meal. Again, top marks for the inventiveness!